In the last post, I explored this idea that every student deserves a makerspace. In this post, I look at some of the most common myths I see regarding makerspaces. I had a vision for a really cool classroom makerspace but I simply couldn’t pull it off. There were too many moving pieces that I couldn’t figure out. Besides, I didn’t have the money or the resources and I didn’t know enough about grant writing to make it happen. I also didn’t have all of the skills to teach students about high-tech prototyping. So, I kept it in a private dream space where I wouldn’t have to do the real work of turning it into a reality. Over the next three years, I slowly transformed my classroom into a makerspace. It never felt like a real makerspace because we didn’t have a 3D printer or the fanciest gadgets. But that was just one of the many myths I had bought into around makerspaces. The truth is that makerspaces can exist in any subject. If a student is creating, designing, building, and problem solving, then the space can be a makerspace. I used to teach photojournalism and STEM. We used the same makerspace-styled classroom space with documentaries and blogging that we used with engineering problems and coding projects. These subjects were on opposite ends of the spectrum but they often required similar needs for flexible spacing, ease of movement, collaboration, and creativity. Similarly, when I taught self-contained, I expected to treat the class as a makerspace when we were doing STEM-related activities. However, I often found overlap between the standards in STEM with the language arts and social studies standards. For example, our Shark Tank style projects was entirely interdisciplinary. A makerspace doesn’t have to be 100% high tech. For example, kids can prototype on a 3D printer. However, sometimes the best technology to develop iterative thinking is actually duct tape and cardboard. Sometimes hands-on learning really should involve our own two hands. High-tech: this is what we tend to think of when we hear the word “makerspace.” It might be circuitry, computers (think Raspberry Pi) coding, robotics, or a green screen studio area. Vintage Innovation: This is where you mash the high-tech and low-tech together. Here kids might do whiteboard videos that combine sketch-noting and video making. Or they might use low-tech items to build something quirky with Raspberry Pi or Arduino. Years ago, I had this mental picture of what a makerspace was supposed to be. So I spent forever focusing on the funding issues. I thought up ways that we could raise money with online campaigns or grants. I researched high-tech supplies and created spreadsheets. I was so obsessed with the stuff that I missed a deeper reality: it’s about the maker mindset. Meanwhile, my students kept making stuff. We transformed our old computers into Linux machines and learned coding. We painted murals. We did cardboard prototyping. I never felt comfortable calling it a makerspace because a “real makerspace” had to look more impressive. Eventually learned that some of the best items in a makerspace are cheap. I could create a green screen studio and kids could use their own devices to record. We could do whiteboard videos. We would use lots and lots of cardboard. Meanwhile, each year newer, less expensive options came out. Now we have options like Raspberry Pi, Arduino, and low-cost circuitry. The word makerspace conjures up images of open, rapid-fire learning. However, a makerspace can be a loosely or tightly structured process. For example, when we use design thinking, we tend to follow a tighter process but when we engage in rapid prototyping, the structure is often loose. I realize that this is an incomplete chart and that we could easily argue where items belong on both spectrums. However, it gives you a snapshot of how we kept things both loosely structured and tightly structured, working on long-term and short-term projects. However, they all have a common element: creative design. I alluded to this in my last blog post. But I think it’s a common misconception. Makerspaces aren’t an escape from learning. They’re not bonus activities to fill up extra time. They exist because making is vital to life on Earth. When kids embrace a maker mindset, they learn to think divergently and solve problems by connecting seemingly disconnected ideas. They learn to take creative risks and try new things. 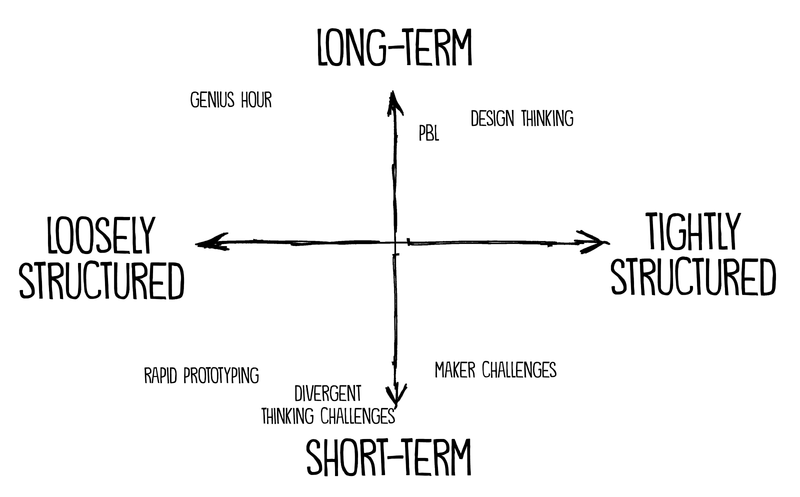 They learn to embrace iterative thinking as they move through the creative process. In the process, they experience failure and develop a growth mindset. They develop grit. Not a no-nonsense, compliance-driven, “we make no excuses” grit but rather a hands-are-dirty, learning is messy kind of grit. Instead, it’s the idea of loving your work so much that you don’t give up. It’s the byproduct of being so excited aout the work you are doing that you choose to push through the frustration and finish your design. I used to get really frustrated when people would focus on the space and not the learning. So, I would say things like, “It’s about the making and not the space,” or “It’s not about the stuff. It’s about the mindset.” I would get frustrated when people visited a makerspace and honed in on the fancy furniture (yes, it’s a standing table but the real difference here is that kids are actually allowed to stand) or the 3D printer or the robotics set. But the truth is that the space still matters a ton — partly because a space is more than simply a collection of times. My kitchen is more than an assortment of beaters and spatulas and pots and pans. It’s a family hub where we gravitate toward to hang out and eat. It’s where community happens. A home is more than a frame and some drywall. A museum is more than a holding spot for painted boxes. A classroom is more than an assortment of desks and books. We infuse these spaces with meaning when we interact in community. And the physical design and layout matter here. We could have school desks in our kitchen. It would be crowded and uncomfortable and we would struggle to have the same community that we have when we meet at a table. Okay, but in the case of makerspaces . . . can’t making happen anywhere? Absolutely. Think of it this way, many kids can buy books on Amazon. They can access books at home as well. But there’s something powerful about entering a library and falling in love with reading. Here, the librarian is a guide that takes them to an amazing world. A great library inspires kids to think and dream and wonder. You can have a drama class anywhere but there is something powerful that happens when kids get to be up on stage in an auditorium. The same is true of a makerspace. It’s an entirely new world of building and tinkering and designing. Kids leave the space inspired to take the making mindset back into their homes and neighborhoods. 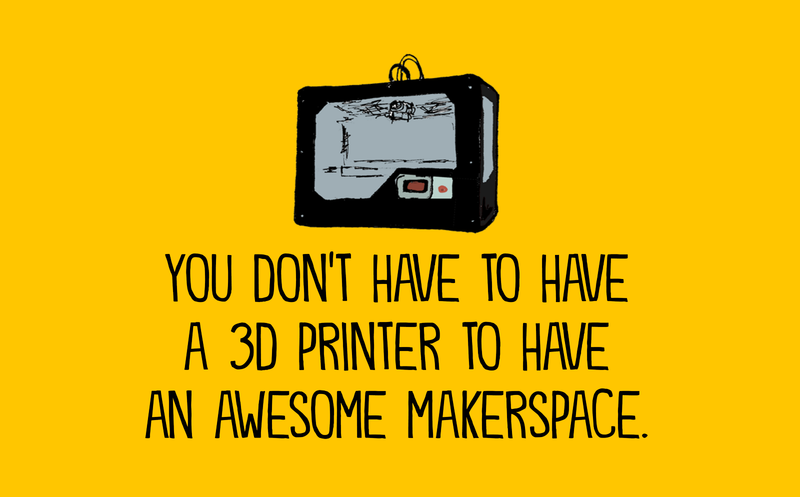 You don’t have to know how to do everything in the makerspace. You might be thinking, “I don’t know how to do Scratch” or “I don’t know how to do circuitry.” However, this is actualy a chance for you to model the learning process with your class. They get the chance to see you struggle and take creative risks. When this happens, you are modeling creative courage. But you’re also empowering them to own their own learning. Certain students will emerge from the group and you’ll watch them teach one another — and you — certain maker-related skills that you didn’t previously have. At the same time, you can take a part of the summer to learn something different. Go make something. Get on Scratch and learn the beginning parts of coding. Learn how to do circuitry. Create your own cardboard challenge and then make something awesome with cardboard and duct tape.